I’m feeling somewhat limited by my current camera, the 7.1MP point-and-shoot goodness that is a Sony DSC-W17 and I feel it’s time to move onward and upward and get something with a bit more power. Looking at the Flickr stats for the W17, it seems that I’m not alone in this. 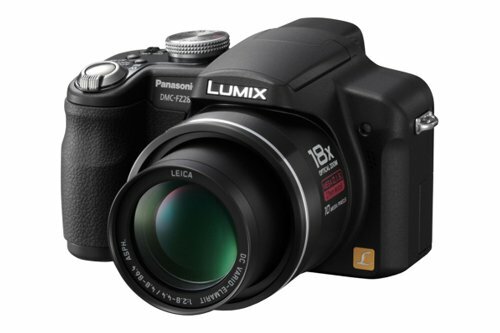 Following extensive research (of both cameras and bank balance), I have decided that while in the UK on the 2009 Kids in Tow Tour, I will be purchasing a Panasonic Lumix DMC FZ28. Now, before you trash my ideas and tell me that I could get a bigger zoom this and a better lens that, that I should be buying Canon or Nikon, Sony or Fuji, I’d like you to take a step back. Because there are certain limitations here. Namely my skill as a photographer and my wage packet as a scientist. What I’m trying to say is, it would be pointless to buy anything more fancy, even if I could afford it. And I’ve done my research. Plenty of it. I have been reading up on Brian Micklethwait’s thoughts for a long while now, although he appears to have about two limitations less than I have have described above. He is torn between Canon and Nikon, but the reviews of the Panasonic are excellent and this seems to be the camera to fit my needs, with a long extendy bit at the front (always nice), a button to press to take a photo and a little clip on either side to attach the strap to. All the boxes ticked. And check out that DC Vario-Elmarit 1:2.8-4.4/4.8-86.4 ASPH. Leica lens. Whatever that means. Glorious. The final clincher, however, was the name. Many hip-hop and rap artists from the 80s who have branched into photography went (obviously) with Kodak. But Joseph Simmons, Darryl McDaniels and Jason Mizell were always a little different, a little ahead of their time and they headed for Panasonic. What’s good for hip-hop is good for digital photography and the fact that it has taken them close on twenty years to bring this baby out tells me that it must be something special.